Dr. Amy Davenport received her bachelor’s degree in microbiology for the University of Texas in 2005 and DVM from Texas A&M University in 2009. After graduation, she completed a one year rotating internship followed by a three-year residency in small animal internal medicine at North Carolina State University, where she performed research in infectious disease. She was board-certified by the American College of Veterinary Internal Medicine in 2013 and joined Gulf Coast Veterinary Specialists that same year. 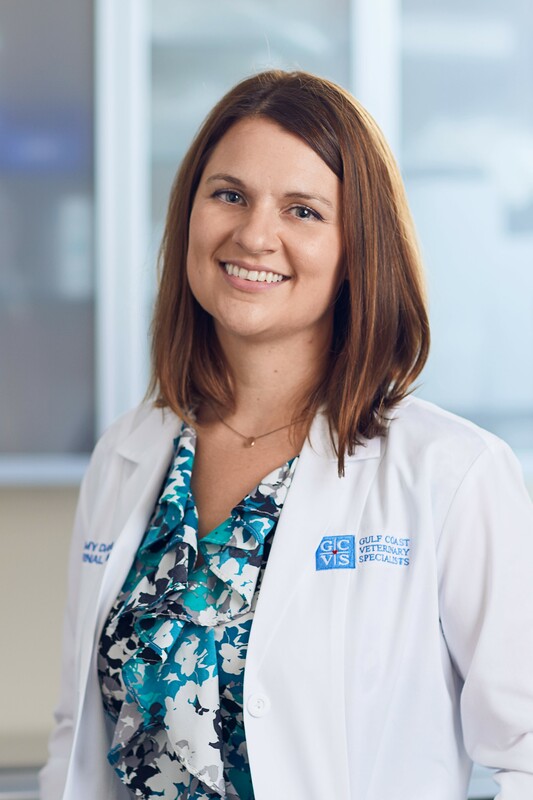 Though Dr. Davenport enjoys all aspects of internal medicine, she has special interest in endocrine, gastrointestinal and immune-mediated disease, along with endoscopy and infectious disease. In her spare time, Dr. Davenport enjoys birding, adventures in nature, playing trivia, watching Spurs basketball, traveling, and spending time with her husband, Matt, and beagles, Kingsley and Bradley. Dr. Davenport always cares for our dog with care, skill, and compassion. We have absolute confidence that Buddy is receiving the best possible medical attention.